Penguin Diner 3 is another point and click game where you have to help the penguin run a diner. 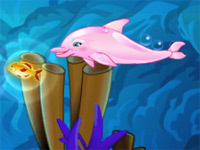 This game is the newest and you can play it here for free! The objective of the game will be collect as much money as possible before the time runs out and the diner closes for the day. The service has to be fast so that the customers remain happy and you will be able to accommodate a large number of customers. The money that is earned can be used to get more accessories for the diner and for Penny the Penguin. If you are playing Penguin Diner 3 for the first time, you should go through the instructions before starting the game. This will give you a good idea on what to expect in the game. In addition to explaining how the game works, the instruction pages also hold some tips to help you perform efficiently. For instance, it is helpful to know that the penguin can carry two trays of food in a go so that you can save on the delivery time. The objective of the game is to make money in the diner business. Money can be made if the customers are happy with the service. To make the customers happy, the diner has to have efficient waiters and chef. It is possible to buy one or two more additional chefs as you gather more money through the upgrades section. You will be able to collect more money if the waiting time for each order is less. Getting a skates which is one of the basic upgrades available is an easy way to get the service done faster. Once a customer enters the diner, the first step is to find an empty table where the customer can be seated. Once an empty table is available, you have to click on the customer and then the table to seat the customer on that table. The next step is to take the order. When the customer signals his readiness for placing the order, you can click on the table so that the order is placed. Once the food is prepared and ready on the counter, you have to click the food. Penny will carry the tray of food when you click on the food and when you click on the right table, the food will be delivered to that table. Once the customer finishes eating, he will leave behind money which can be put into the cash register by clicking on the table. Like in many other diner games, you can buy a variety of things for the diner from this section. Once you have some money in the bank, you will be able to buy things. The new diner does not have any special arrangements like entertainment options or comfortable chairs. All of these and more can be purchased from the catalog or upgrades area. The high scores section links you to a page where the high scores for that game achieved by different players are given. You can also submit your score to the section by clicking on the submit score link. This is a point and click game so you do not have any functions that require you to use a keyboard. All you need to play this game is your mouse or touchpad. All actions like seating a customer or taking the order can be performed simply by performing a left click on the mouse.